A compact, closely-knit dog of medium size, a leggy Spaniel having the appearance as well as the agility of a great ground covered. Strong, vigorous, energetic, and quick of movement. Hair dense, flat or wavy, never curly. Not as fine as in other Spaniel breeds, and never silky. Furnishings not profuse. The ears should carry little fringe. Neither the front nor hind legs should carry heavy featherings. Skin fine and fairly loose. Colour dark orange and white, or liver and white. Some ticking is desirable, roan patterns or factors of any of these colours are permitted. The orange, and liver are found in standard particolour, or piebaldpatterns. Weight: Should weigh between 30 and 40 lb. (14-19 kg). Height: 17-1/2 to 20-1/2 inches (44-52 cm) measured from the ground to the highest point of the back, the withers. 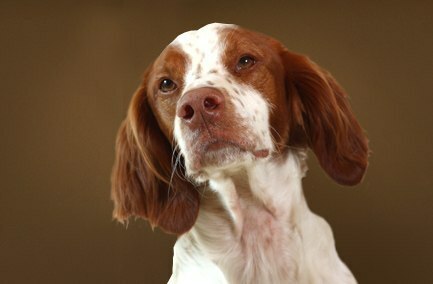 In contrast to Springer Spaniels, Brittanys are predictably friendly, playful and trustworthy family dogs. Although moderately trainable, most are unreliable off leash. Brittanys are generally healthy with some incidences of hypothyroidism and epilepsy.